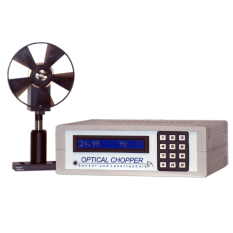 Choppers are used to modulate optical radiation for fast and very sensitive measurements of the optical power in combination with pyroelectric detectors, especially in the THz region. It's possible to set the target frequency by keypad or USB-port. The actual frequency is displayed by a large alphanumerical LCD display and is also sent to the USB port. The chopper automatically detect the number of slots of the disc to calculate rigth correlation between frequency and motor speed.